The bell from the wreck of a steam vessel sunk by a German U-boat in a WWI torpedo attack has gone on display for the first time in Greater Manchester. The bell of the SS Conargo, which was attacked off the Isle of Man in 1918, is one of 40 exhibits at Hazel Grove Sub Aqua Club. It is engraved with the word Altona, the original name of the ship. Stockport diver Simon Rodger, who found it in 2003, said it was "nice" to put it on show. The Conargo was attacked by the German submarine on Easter Sunday in the Irish Sea off the Calf of Man, an island at the south west tip of the Isle of Man. The Australian ship, which had been seized from its original German owners in 1914, was hit by a torpedo and eventually sank two days later off the coast of Anglesey. Around 10 men lost their lives in the attack, though other crew members escaped in lifeboats to Dublin and Holyhead. 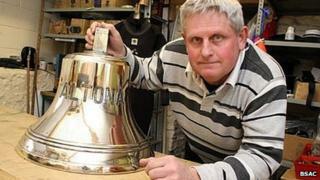 Mr Rodgers, who has been diving for more than 30 years, said the bell was among his most treasured finds. "I only ever see myself as a custodian of objects like the bell of the Conargo," he said. "They will stay with me until I pass them on to my children and if that is not possible, then I will find a museum for them because they are an integral part of maritime history. "That's why it is nice to put it on public display for the first time and let others see the bell." He added that the fact the bell bore the name given to it by its original German owners was "ironic given that it was sunk by them in the end".